I think it’s a mistake to learn forefoot running in running shoes, such as the Saucony Kinvara 2, simply because, structurally, the shoe is similar to the traditional running shoe, which are the background drivers for heel strike running, a running style that is health harming. A more acceptable, less biomechanically disruptive approach is learn forefoot running in barefoot-like running shoes, such as the Vibram Five Fingers. Saucony Kinvara 2 — Would you consider it a barefoot/minimalist running shoe? The qualities of a minimalist shoe needed to properly develop a forefoot strike landing during running are a low heel, preferably a zero-drop design, super flexible and has minimal padding, and the Saucony Kinvara 2 does not satisfy these qualities. 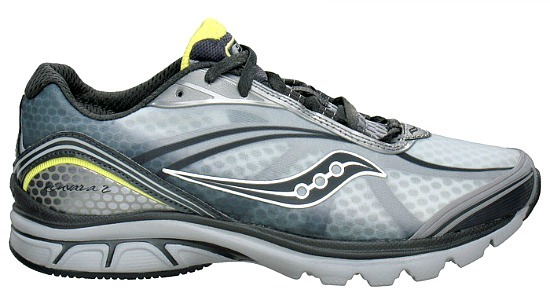 The Saucony Kinvara 2 is regarded as a minimalist shoe. However, due to the cushioned heel, barefoot kinematics cannot be mimicked in the Kinvara 2s, rendering the shoe unacceptable for forefoot running. Squadrone et al. set out to test whether the Kinvara 2 would induce immediate adjustments in biomechanics similar to barefoot running (i.e. forefoot running), with a comparative study of other minimalist shoes, such as the Nike Free, Vibram Five Fingers Seeya and the Inov-8-X 200. The researchers concluded that the Saucony Kinvara 2 as well as the Nike Free failed to reproduce kinematics of barefoot running as the spatio-temporal parameters did not differentiate between regular running shoes and the Saucony Kinvara 2. That is, runners who wore the Kinvara 2 had similar forces applied to the heel, knee extension and ankle dorsiflexion to runners in regular running shoes. In addition, runners in the Kinvara 2 had greater stride length, step time and ground contact time as compared with runners in the Vibram Five Fingers. The researchers also found that running shoes with a cushioned heel, like the Kinvara 2s, resulted in a greater vertical hip displacement, which may encourage greater landing force during running. Taken from the study, an illustration showing vertical hip displacement during running. A greater vertical hip displacement also corresponds to a straighter support leg to compensate for reduced ankle range of motion at touchdown during running. Other researchers have noticed that greater knee excursion corresponded to reduced ankle range of motion, which forces the knee to attenuate more shock during heel strike running. The researchers then posited that the Vibram Five Fingers had no effect on barefoot running kinematics, meaning that these shoes would not interfere with the forefoot running style of an habitually barefoot runner. On the flip side of this relationship, alterations in forefoot running mechanics is principally driven by the cushioned heel of a regular running shoe. This is not surprising. And of course, high loading rates and impact forces are an outcome of cushioned heeled running shoes during running (Hsu, 2012). For years, researchers refused to attribute running shoes to injury. That attitude is now changing, thanks to these studies. With that said, the Saucony Kinvara 2s cannot be labelled as a minimalist shoe for forefoot running because biomechanical problems in learners will arise due to the stacked heel and decreased foot proprioception. Forefoot Running Causes Plantar Fasciitis? Hamill, J., Gruber, A. H., & Derrick, T. R. (2012). Lower extremity joint stiffness characteristics during running with different footfall patterns. European Journal of Sport Science, 14(2), 130 –136. Hsu, A. R. (2012). Topical review: Barefoot running. Foot & Ankle International, 33(9), 787 – 794. Squadrone et al. Acute effect of different minimalist shoes on foot strike pattern and kinematics in rearfoot strikers during running. J Sports Sci, 2014; 33(11):1196-204.